The rooms are now all connected, I just need to lock them & populate them, then add a little screenshake when the water level changes, and set up one last switch! tempest has some actual up & down attack animations now! I also adjusted the timing on the halberd animation to add a bit more anticipation, although the side will need more reworking later....but another time!! added some rough water & stair tiles and begun working on allowing tempest to swim, & also setting whether or not the room is cleared! after that i want to start building the dungeon part of the game!! - slimes now wander around when tempest isn't near, & are animated and have timed movement! I keep forgetting about gun time 😆 but anyway! gun is Done although I need to animate the up & down directions, but functionally its done! but thats going to take a lot of thinking about! I have a few ideas on how to do this, but it's certainly going to be time consuming so I'll leave that for another time. anyway next up is her halberd! I'm gonna be making a little wee zelda-like dungeon with my dnd character Tempest! Anyway here's what I have so far! I'd like to make my own tileset & music & go beyond sketch sprites eventually, but that's beyond the scope of this jam I think! - make the gun actually do stuff, & add her halberd. Also sidenote her gun is actually a wand that looks like a gun, fun fact. it shoots spells! - Build the dungeon itself! gotta add puzzles and traps. I'm thinking some funky lil spikes & raising/lowering water levels to get around, but that may prove more time consuming than I want so we'll see...! but anyway the only real new thing i have to show is that I've started on dialogue? I've learnt quite a lot during this jam!! But like I guessed, I haven't finished in the space of this jam lmao, and I won't finish in the next few days. ooh gosh the concept art for this looks super cute!!! but i've made a lil farming space and got that tap to change direction thing working! wAH sorry for like, being gone for like two days!!! but doing this broke like. everything!! the "set variable" system function just wasn't doing anything at all, so things like my clock and items and plants just didn't work anymore. This morning I went through and reorganised all my code. theres still some bugs, the clock is still a little broken but im working on it (´꒫` ;).. Anyway after i finish fixing stuff the next thing i'll code next is probably a planting area? instead of being enabled on the Entire Farm. 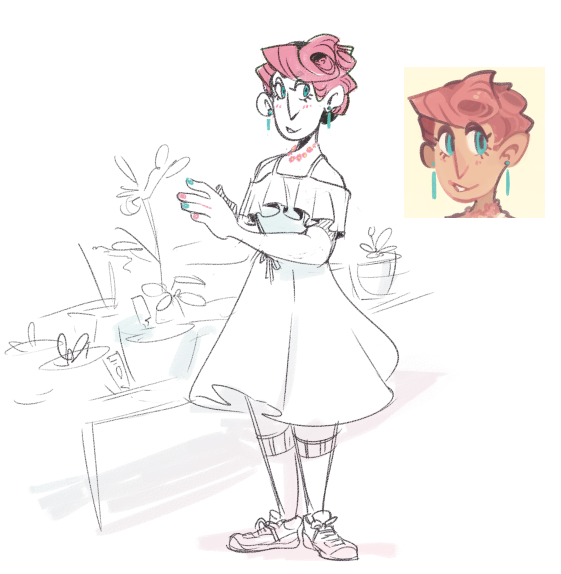 I also wanna make npcs but thatll be a Lot of work so im focusing on making the farm work first. i've been busy coding !! - Item select: the game recognises whether you've set an item to the X key or not in the pause menu, and tells you if you havent. - Plants! Or well, squares for now. You can water green squares, if they have been watered then the next day they will turn blue and solid. You can then water them again, and they'll turn turquoise and you can pick them. The days it takes for a plant to grow can be changed! - Directional cursor: I'll hide it in the final game, but depending on which way you're facing you can interact with the square in front. Since there's no directional sprites at the moment, the square is highlighted! - Stamina: If you use up all your stamina, you black out and are forced to the next day, and only start with a tiny amount of stamina. If you go to sleep, you'll regenerate much more stamina and be able to do way more in a day! I don't have a massive amount to show cause I'm like in the middle of animating at the moment haha, please excuse the mess;; but !! but! 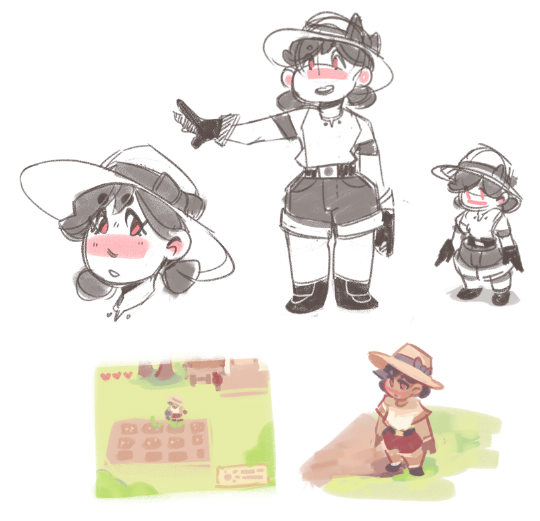 I'm hopin to make a tiny lil farming sim !! I don't expect to make a full game in this jam but it'll be fun to try !!! the biggest thing im gonna have to work on is a time system (´꒫` ;)..
My First Game Jam: Summer Edition community · Replied to e jackson in Pre-Jam Discussion: Introduce yourself!